Design and execute a building enclosure that dramatically reduces the amount of energy required to satisfy the occupants. Specify appropriate mechanical equipment that can meet the reduced energy demands, and be powered by a renewable resource. Match the renewable resource (solar panels, wind turbine, etc.) to the power demands to eliminate the need for purchased energy. Of the three steps outlined above, this is the most difficult. Each component of the building; walls, roof, windows, floors, etc., has to be re-thought with dramatic energy use reduction in mind. This can mean a doubling of R values, superior windows with maximized performance based on orientation, and an expansive effort to eliminate air leaks. At the same time that we are improving the building envelope's thermal properties, we take steps to prohibit condensation, mold, and mildew. In addition, we design to allow building components that may get wet, a means for drying without consequences to the durability of the structure. There are many ways to cut energy loss from a building, and solutions vary with the individual parameters of the project. Whatever building products or systems we use, our approaches are grounded in the wealth of information that has been produced by the building science community, which provides guidance for creating healthy, durable structures. It is very difficult, if not impossible to achieve comparable, cost-effective results after a building is built. This puts the highest priority on getting the thermal envelope right at initial construction. That said, there are millions of existing buildings that will need to undergo deep energy retrofitting to remain viable. We have worked on many retrofits, usually done in conjunction with other necessary renovation. When we make the commitment to eliminate fossil fuels, our options for heating, cooling, and domestic hot water, are related to the type of energy that we can supply from renewable resources. Most often, this source will be electricity from wind farms, or electricity from solar panels, known as photovoltaic arrays. There are many ways to condition space using electricity. These include electric resistance heating, ductless mini-splits (a form of air-source heat pump), and ground-source heat pumps. The scale, complexity, budget, and goals of the project are contributing factors, among others, in making determinations about appropriate equipment. As heating loads are reduced by an improved thermal enclosure, domestic hot water (DHW) energy requirements become a larger share of the total home energy use. We must therefore pay careful attention to how we meet this challenge. Some space heating equipment is capable of producing hot water for domestic use. Other options are available, including solar thermal panels. As we tighten our buildings, we also pay attention to maintaining a high quality indoor air environment. This begins with careful specification of building products and finishes to eliminate pollution-producing items. This is followed by point-source and/or whole-house ventilation systems to provide fresh air, where and when it is needed. In most instances, the renewable energy is provided by solar photovoltaic (PV) panels in an arrangement with the local utility company called net metering. 42 states in the U.S. now have net-metering laws, although some particulars may vary. Net metering mandates that the local utility accept excess power generation from a solar array at retail price (the meter spins backwards! ), when the system is producing more energy than the building requires. When the array is not producing adequate energy, power is purchased, just like in everyone else's home. At the end of the billing period, there is either an outstanding balance, or an energy credit. In many states (NY included), this tally is rolled over to the next month, to be settled-up at the end of 12 months. If the array can produce the amount of energy required by the building on a annual basis, there is no bill for the electricity. This is a vitally important arrangement, especially in the Northeast, because the solar array produces far more energy during summer months when the days are longer and clearer. 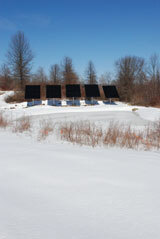 The greater energy demand however, is in the cold winter. This ability to annualize the energy production/consumption makes the system practical.